It is essential that daughter cells be exact duplicates of the parent cell. Mistakes in the duplication or distribution of the chromosomes lead to mutations that may be passed forward to every new cell produced from the abnormal cell. 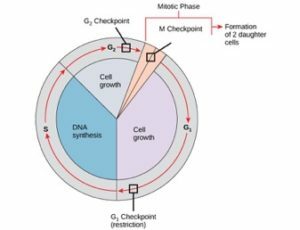 To prevent a compromised cell from continuing to divide, there are internal control mechanisms that operate at three main cell cycle checkpoints at which the cell cycle can be stopped until conditions are favorable. Figure 6: The cell cycle is controlled at three checkpoints. Integrity of the DNA is assessed at the G1 checkpoint. Proper chromosome duplication is assessed at the G2 checkpoint. Attachment of each kinetochore to a spindle fiber is assessed at the M checkpoint. The first checkpoint determines whether all conditions are favorable for cell division to proceed. This checkpoint is the point at which the cell irreversibly commits to the cell-division process. In addition to adequate reserves and cell size, there is a check for damage to the genomic DNA. A cell that does not meet all the requirements will not be released into the S phase. The second checkpoint bars the entry to the mitotic phase if certain conditions are not met. The most important role of this checkpoint is to ensure that all of the chromosomes have been replicated and that the replicated DNA is not damaged. The final checkpoint occurs in the middle of mitosis. This checkpoint determines if all of the copied chromosomes are arranged appropriately to be separated to opposite sides of the cell. If this doesn’t happen correctly, incorrect numbers of chromosomes can be partitioned into each of the daughter cells, which would likely cause them to die.